Libby, OverDrive’s new app for ebooks and audiobooks, is a breeze to use on the whole. But it lacks all-text boldface and some other typographical amenities that many library users would appreciate. You name your library, type in your library card number and go through a few other simple steps, once you’re past the opening screen. And bingo, that’s it. Nice job! I’d appreciate a more text-oriented option for the times when I just want to find a book—not worry about the view along the way. But that aside, I really like the aesthetics and the general interface of this app for iOS and Android. What’s more, if you hold cards from multiple libraries, you can easily scoot back and forth between institutions, and Libby even allow for different cardholders within the same family. Also, Libby is a nice way to search for titles that you can then read in on a Kobo Aura One, made by OverDrive’s corporate cousin. Unfortunately, however, like other cloud-based OverDrive apps, this one lacks full accessibility. In the traditional OverDrive library app you could summon up boldface fonts, so useful to older library users as well as certain K-12 kids with special needs. But like at least one other cloud-based app from OverDrive, Libby lacks it. The screenshot below makes the type look sufficiently bold. Believe me, however, in real life, that will not be the case for me and millions of others with contrast-sensitivity issues. In fairness to OverDrive, the company does say that “Libby does not yet offer accessibility or multilingual features. If you require accessibility or would like to use an app in a language other than English, please use the OverDrive app instead of Libby for the time being.” Libby has not been officially released. So maybe there’s hope for all-text bold in Libby before OverDrive locks up. But if bold is definitely on the way, OverDrive should have told me. It took years of pleas from TeleRead and others, but Amazon finally gave us the all-bold option on recent E Ink Kindles, and OverDrive needs to be competitive even if Libby is an app rather than a dedicated reader. Kobo E Ink readers have offered bold for eons—you can even adjust the font weight. What’s more, they let you smoothly change margins and line spacing without your having to live with presets. That’s another way Libby could catch up with Kobo. I’m only dreaming, but ideally someday Libby could even offer an advanced typographical setting screen that, feature for feature, matched Moon+ Reader Pro, probably the feature champ among ereading apps. I have two other suggestions. I normally want to search only for ebooks and only among the titles available. Libby’s setting should make it easy for that configuration, or another, to be a personal default unless overridden. Also, while I appreciate Libby’s ability to let me take notes, I should be able to export them to a file or e-mail them. How about it, OverDrive? So many of your users are students. Why can’t you better help them save and organize the information they obtain from the books? Note-taking issues are among the major complaints that Luddites have against ebooks, and you’re in a position do something. In the future, for people who believe handwritten notes are best, you might even build that capability in via a stylus. Note-taking in ebooks could especially benefit as well from voice recognition, and at least, that is already available and should only get better. Compared to past years, OverDrive is no longer as influential in the International Digital Publishing Forum as before—IDPF looks about ready to finalize the merger with W3C despite the company’s objections. One way for OverDrive to help regain influence would be to respond nimbly to users’ demands and make librarians happy at the same time. Improving Libby wouldn’t hurt. There is one other consideration out there. Libraries are experimenting with SimplyE, an app that works with ebooks from different vendors. I have not tried SimplyE yet. Most likely it is not as rich in features as OverDrive apps, but in time SimplyE might well evolve and surpass OverDrive apps—one more reason for OverDrive to care. In fact, if OverDrive is really smart, the company itself will develop an app that can work not only with its own ebook collections but also competitors’. But back to Libby. Try it. What do you think? I like it. Seems like they have streamlined some features which is nice. The tagging feature is also good. I like that it can automatically pull up collections on the fly (more than we have actually published) Also our published collection actually shows the text that we have added in the backend to explain the specific collection. OverDrive for schools has note-taking ability, along with exporting those notes in a few different ways. I’ve been waiting for it to hit the public libraries but until then I’ll be using Kindle’s feature for that (well, except the exporting). @Benelegere: Thanks. Obviously I’m already aware of the notetaking ability for the public library edition, and now it’s good to hear that the school version has exporting. Probably, then, it should be easy to add it to the public library version. This needs to be on OverDrive’s agenda along with other improvements such as all-text boldfacing. Overdrive claims that Libby can hold multiple-library cards (more than one library, not just more cards from same library). If so, they’ve hidden it way too well! You can borrow titles from as many libraries as you like. To switch to a different library, tap Menu icon [those lines], then Switch Library. You can search by library name, city, or zip code. Or, tap a library under “your libraries” to view its collection. To save a library, add a card for it (under Menu icon > Library Cards). I have 3 cards, from 3 different libraries, in 3 different states all show up in my Libby account. I simply added a new card. I am not sure why you aren’t finding it, but I LOVE this feature. I hope someone can help you find it. I just downloaded the app and so far I like it because I don’t have to actually go to my library’s Overdrive website, it’s already on the app. BUT, and to me this is a HUGE but, I can’t seem to turn the pages of my book using my volume buttons. This option is available on the Overdrive app, so why not in Libby? Or if it is I have not been able to find it. Any ideas? @Susie: You’re so, so right about the volume buttons in Libby! And if you can contact OD Tech Support and ask for the all-text bold option, too, that would be terrific! Dang, alright I will see what I can do. It’s clearly not feature complete yet, but the new interface is quite a lot better than the overdrive app. The biggest feature that it has working is holding multiple library cards, letting you find books that would otherwise require logging in and out repeatedly. Accessibility should be their next step, then hopefully android auto compatibility. I have had a terrible time with Libby. I listen to audiobooks more than I read ebooks. Libby loses my place and I have to try to skip ahead to avoid hearing passages over and over. Many times I can’t fiddle with it because I’m driving. Michele, what device are you using? I just bought the newest Kindle 10th generation paperwhite and it will download an audible book fine, but it will not d/l an audiobook from my local library. It will download reading ebooks just fine, but will not d/l audio ones. Is it common for the book to not be complete? I’ve read 2 chapters so far, at the end of each chapter it seems to start another sentence. I assume there are pages missing or just words? My wife downloaded the epub from our library… on her iPad. Where is it? I learned about the Libby app for iOS and installed it on her iPad and got her book. She has finished reading it, but cannot return it via Libby. It saw it was downloaded as an epub and to use that app to return it. Well, that app was the Google Chrome browser on her iPad used to access the library’s web site. Can she return it or will she just have to let it expire? @DumbledorBob: Here’s OverDrive’s word on early returns: https://help.libbyapp.com/troubleshooting/why-cant-i-return-a-title/ . For more information, ask your local library to reach out to OverDrive support. I found that ‘Help’ before leaving my comment. I’ll see what our library can do, there are 29 others waiting for that eBook. DumbledorBob: Please do share with us what you find out. Thanks. 2. DO NOT download the epub in the Chrome browser on an iPad (or iPod or iPhone). I have been downloading Audio and ebooks for probably more than 15 years, and it was so easy. Then Overdrive changed for the bettr ex: sign off went sign off logo present on the screen to home, account, sign off. No sure how 3 steps better than 1. So new app Libby, after trying it and finding it so frustrating to do anything I deleted it. Newer is not necessarily better, and definitely not Find. download, done, old system, couldn’t figure out how to log off, after 45 min, deleted. When I switched from Overdrive to Libby, I was sad to see that I can no longer request a book that is not on the library list, as I could on Overdrive. OVERDRIVE provides both book and audio reviews. Does LIBBY? I was not able to find any reviews. Another nice-to-have feature would be to have voice-activated page-flipping! Please? It would be a great help to our physically challenged reader. I have downloaded audio-books for years from the library via Overdrive and the new one is awful. Can’t figure out how to download the books to Overdrive and transfer them to my android phone. Tried Libby and thought I had downloaded the books, but now my data provider is charging me date to listen to the book I downloaded. Progress is not always a good thing. I have cards from multiple libraries. It would be nice to have a way to search all the libraries at once rather than switching libraries and checking each one! Why, can’t I lock mysubjects and settings on ? I particularly want to NOT be offered audiobooks… ever because (a) I hate them and(b) I can’t stand favourite books narrated with unlikely tones,emphases or accents. I have an older Kobo and it won’t load Libby! I get incompatible with device message in the play store. I use it on my Note 8 ph fine. Not going to get rid of a working Kobo to use it. I find overdrive has occasdional issues on my Kobo searching for ebooks using categories. So I just search and borrow on my phone and dl on my Kobo later. I have not been to find out how to have a book rotate or auto-rotate like Overdrive does. Any ideas? To ask for help, Libby requires me to put in my library name and acct number. That’s silly! 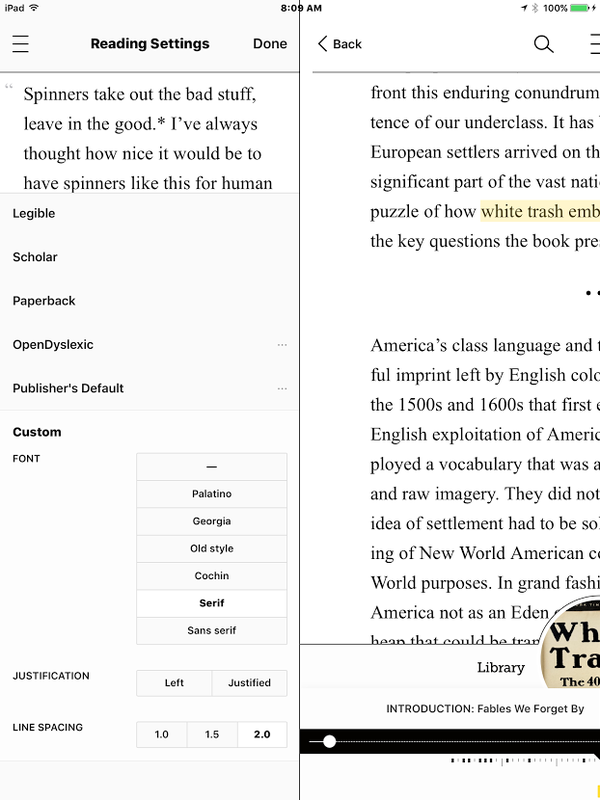 @Carol: See if your ereader, tablet or phone has an auto-rotation option outside the Libby app. Not the perfect solution but better than nothing.